With Tiger (temporarily) out of the picture, Rory McIlroy, the 20 year old Irish phenomenon, has done his part to step up to the tour's upper echelon. 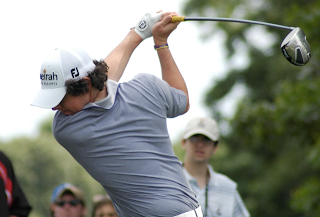 McIlroy contended for several majors last year, and he made his name known on this side of the pond by jumping onto the PGA Tour this year. He has already launched into ninth place in the World Golf Rankings. In his early days, Tiger made a number of public appearances with Arnold Palmer. McIlroy is following in this pattern perhaps but with Jack Nicklaus instead. Golf Magazine is reporting that McIlroy turned to Nicklaus during the Honda Classic. The two met for a meal and apparently enjoyed a productive discussion about golf and competing for the game's biggest titles. McIlroy said, "It was great to sit down and talk to him and see his approach to winning and what went through his head whenever he was in contention... It was probably the best 90 minutes I've spent in a long time." Cool story. We'll see where that relationship heads. 0 Response to "Rory McIlroy meets with the Golden Bear"